USTAR • New biotechnology building is meant to encourage collaboration among scientists, researchers in myriad fields. 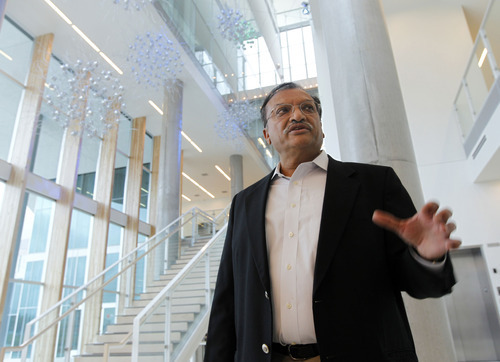 Al Hartmann | The Salt Lake Tribune Dinesh Patel, USTAR board chairman, tours the James L. Sorenson Molecular Biotechnology Building, the University of Utah's new $130 million USTAR facility, on Wednesday April 18. The building is being dedicated on Thursday, April 19. 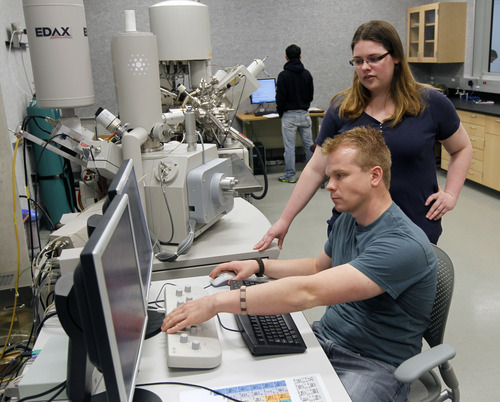 Al Hartmann | The Salt Lake Tribune Undergraduate mechanical engineeers Ben Anderson and Sadee Hansen work on an electron microscope in the microscopy suite at the James L. Sorenson Molecular Biotechnology Building. 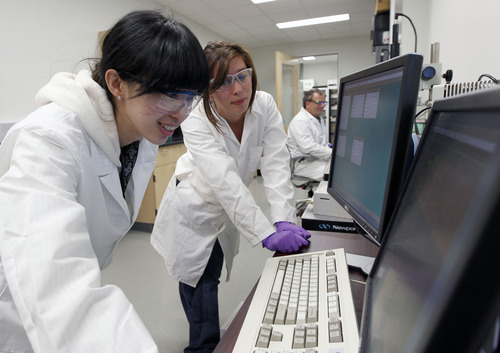 Al Hartmann | The Salt Lake Tribune Di Hu, left, China Lim, and Dr Rostislav Bukason work on nanoscopes at the James L. Sorenson Molecular Biotechnology Building, the University of Utah's new $130 million USTAR facility. Al Hartmann | The Salt Lake Tribune USTAR analytical chemistry professor Marc Porter describes the interdisplinary approach to research that takes place in the James L. Sorenson Molecular Biotechnology Building, the University of Utah's new $130 million USTAR facility. 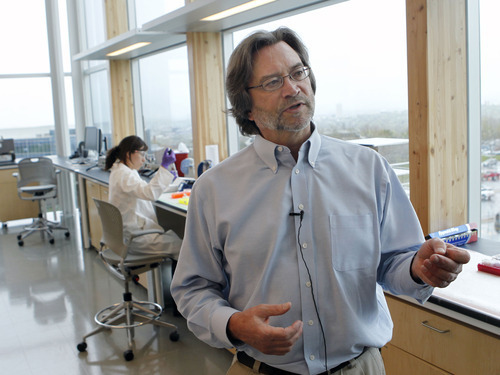 Al Hartmann | The Salt Lake Tribune The James L. Sorenson Molecular Biotechnology Building, the University of Utah's new USTAR facility, cost $130 million, most of which was contributed by taxpayers. The building will be dedicated on Thursday, April 19. Al Hartmann | The Salt Lake Tribune Atrium and stairway in the James L. Sorenson Molecular Biotechnology Building, the newUSTAR facility at the University of Utah. Al Hartmann | The Salt Lake Tribune Artwork in the James L. Sorenson Molecular Biotechnology Building. The $130 million USTAR facility will be dedicated on Thursday, April 19. 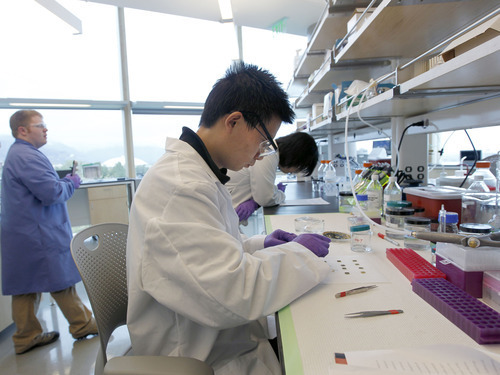 Al Hartmann | The Salt Lake Tribune Yigiang Chen, post doctoral fellow, tests for invasive fungal infection of the lung in the electro chemistry lab at the James L. Sorenson Molecular Biotechnology Building, the University of Utah's new $130 million USTAR facility. The building is being dedicated on Thursday, April 19. Al Hartmann | The Salt Lake Tribune The James L. Sorenson Molecular Biotechnology Building, the University of Utah's new $130 million USTAR facility, will be dedicated on Thursday, April 19. Marc Porter is a smart chemist, but he can't solve the diagnostic puzzle of pancreatic cancer on his own. He needs surgeons, molecular biologists, oncologists, pathologists and engineers to help identify the disease's many biomarkers, develop assays for detecting them, and fabricate tiny biosensors that can be used in a clinical setting. 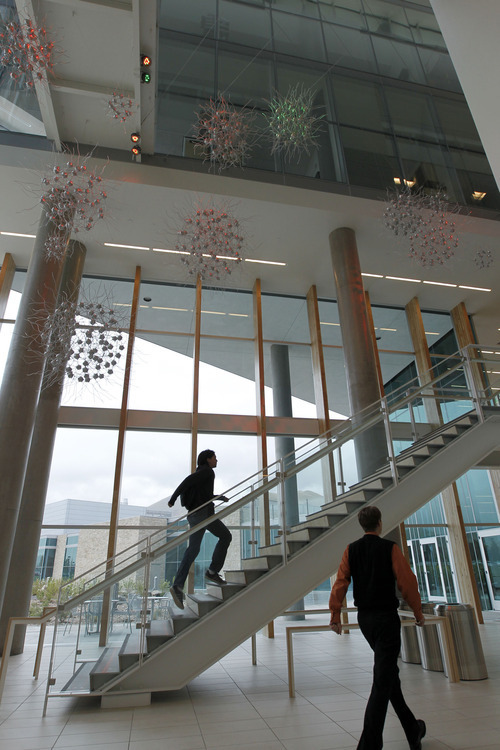 That's the kind of cross-disciplinary research being done at the University of Utah's new multi-million-dollar USTAR building, which houses the nanoscience center Porter co-directs. 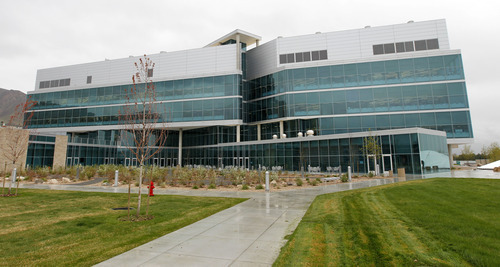 The 208,000-square-foot facility features open lab, office, conference and atrium spaces designed to promote collaboration and facilitate chance meetings among scientists from different fields, according to Dinesh Patel, the board chairman for the Utah Science, Technology and Research initiative (USTAR). USTAR is the state-funded initiative to leverage federally-funded university research into technology to drive innovation and economic development in Utah. "All will have some activity here. That's the beauty of USTAR. This won't be one department moving in. 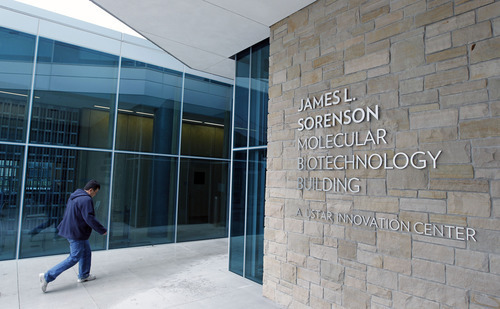 This isn't a one-technology building," said Patel, who will help cut the ribbon Thursday on the James L. Sorenson Molecular Biotechnology Building. Since March, USTAR research teams have been moving into the $130 million building, equipped with state-of-the-art facilities to spur hoped-for breakthroughs in nanotechnology, neuroscience and renewable energy. Named for the late Utah biomedical innovator, the building is a commanding presence on what used to be a golf course between the U. 's School of Medicine and a cluster of engineering facilities. "We wanted a bridge between upper and lower campus. The golf course was the only space available for that," said Patel during a tour of the building Wednesday. The project included creating the infrastructure to support a future multi-building USTAR campus. The U. and Utah State University have established 20 USTAR teams in five research areas. U. teams are exploring brain circuitry, neuroimaging, carbon sequestration, wireless nanosystems, cell therapies, biomedical devices and other areas in which the school is strong and where there is commercial potential. The U. so far has recruited 32 "principal investigators" to lead the teams, which have secured $80 million in research grants as of December, with another $81 million pending. Among the biggest is a recent $12 million grant from the National Science Foundation to support basic research into new materials for such uses as faster computers and communications devices, and better microscopes and solar cells. The Sorenson building is perhaps the U. 's most transparent. Many of the exterior walls are floor-to-ceiling glass, allowing natural light to permeate labs and gathering areas. Any passerby can look up and see scientists at work. Thanks to the "one percent for the arts" program, some features engage the brain's right side, such as sculptor Cliff Garten's "NeuroStars" and photographs produced from scanning electron microscope imagery by David Scharf. Garten's suspended installation, which replicates neural cells, floats in the atrium like some alien sea life. The new building's most cutting-edge feature is an 18,000-square-foot nanofabrication unit to produce materials less than 100 nanometers in size (that's 1,000 times smaller than the diameter of human hair.) The space must be kept absolutely free of dust and vibration. It is secured to a concrete foundation, up to eight feet thick, to insulate the lab from vibrations, as from a lawn mower or a passing TRAX train. The new building houses the U. 's Brain Institute and the Nano Institute, Porter's research center investigating new diagnostic and medical treatments that manipulate materials on the molecular level. Such research can be conducted only by scientists collaborating across disciplines because so many different skill sets and knowledge bases are required, Porter said. His team, which includes surgery department chair Sean Mulvihill, is developing sensors capable of simultaneously measuring numerous biomarkers associated with pancreatic cancer, which is notoriously difficult to diagnose. This malignancy is among the most deadly because it can't be detected until after it spreads, Mulvihill said. Pancreatic cancer's cellular diversity poses the biggest challenge: The disease manifests in a variety of ways, leaving behind a multiple biochemical traces. "There isn't one single thing that goes wrong with the blood. There is no reliable marker for the disease," he said. So the strategy for early diagnosis is a panel of markers. His candidate list includes 140 proteins, but the USTAR team is currently zeroing on seven strong suspects. The project's total cost, mostly provided by the state. Amount provided by the Sorenson Legacy Foundation.